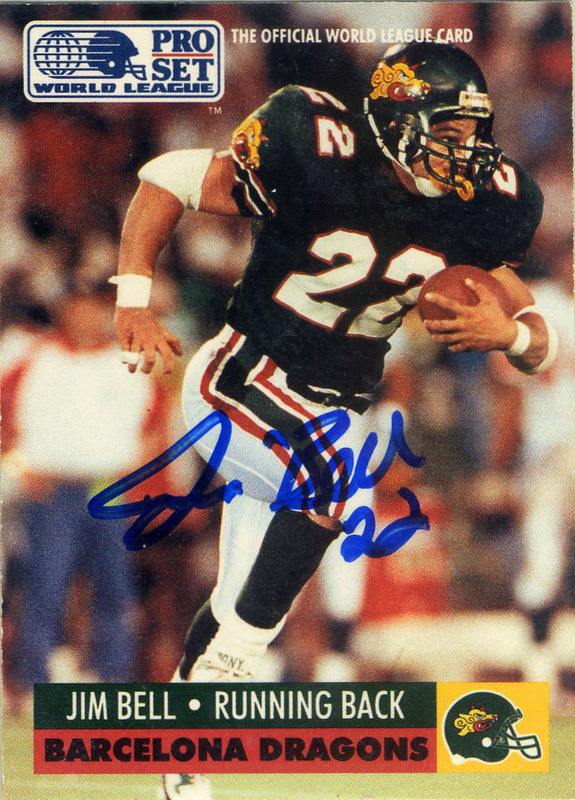 Jim Bell was originally drafted in the 11th round by the San Fransisco 49ers in 1989 where he was placed on the team’s practice squad. In 1991 the Barcelona Dragons drafted Jim in the 2nd round of the WLAF’s positional draft reuniting him with his former college coach from Boston College, Jack Bicknell. Bell led the Dragons in rushing in 1991, rushing for 367 yards but only on a measly 2.7 average. In 1992 Bell was traded to the Birmingham Fire who were looking for looking for a change of pace in their backfield. Jim averaged 4.2 yards a carry that season. When the league decided to reorganize after the 1992 season Jim hung up his cleats and retired. Since football Jim has become the creator and co founder of the company Foamheads, which markets a variety of sports fan foam head wear and collectibles.